TO PROVIDE THE BEST POSSIBLE SERVICE AND PRICES TO OUR CUSTOMERS. 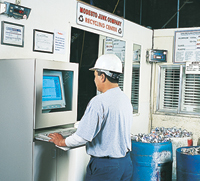 At our scrap metal recycle center, Modesto Junk Company uses Computerized Recycling Software to keep everything running smoothly for maximum efficiency. Allowing for quick and easy transactions – and a pleasant recycling experience – for all of our customers.